Located on a corner in a West Allis neighborhood, unsuspecting cars might drive past this gem everyday, thinking it is just another house; however, they are unwittingly missing out on a very special restaurant. The Farmer’s Wife might just be West Allis’ best-kept secret. The restaurant sources ingredients from local farmers, meat handlers and RSA’s such as, Kettle Range Meats, Growing Power, LOTFOTL, and West Allis Farmer’s Market. They have also partnered with Anodyne Coffee. We had been in here for lunch a few times, but today was the first time we checked out their brunch; upon arrival, we found out that here is a Bloody Mary Bar on Sundays from 10am to 2pm! They begin by serving you a glass of vodka and a chaser. You use their homemade Bloody Mary mix and your favorite spices to mix your drink–then add your skewers full of toppings! Spice: Not too spicy, but you can add more spices to appease your palate. Chaser: Choose from many offerings. Today we had Surly. Fixin’s: See above for the plethora of options, including cheese curds! The Bloody Mary was delicious and the price was just right. Our drinks paired perfectly with our most appropriate brunch orders as well: My two dining partners and I enjoyed the Brunch Burger, the Brunch Poutine and the Brunch Wrap and cups of coffee. We all left full and happy…. we will be back! We recently paid a visit to Lucky Joe’s Alchemy and Eatery a relatively new “speakeasy” type establishment in the Wauwatosa Village. When the restaurant first opened over the summer, it was intended to be the speakeasy sister of Lucky Joe’s Tiki Bar in downtown Milwaukee; however, soon after the Wauwatosa bar opened, the Tiki Bar closed. We were big fans of the Tiki Bar and love to try new places, so we visited the Tosa location about 1-2 weeks after it opened, looking forward to the speakeasy vibe on a weekend evening. Unfortunately, we had a disappointing experience and chalked it up to their newness, so we decided to give them another try, this time, for brunch. Lucky Joe’s AE currently serves a “eat what you’re given” brunch, which consists of two ham sandwiches, cheesey mashed potatoes and scrambled eggs, plus your choice of a Bloody Mary or mimosa for $14. This seemed like a good idea, so we headed there on a brutally cold Sunday morning. Perhaps the weather kept the crowds away, but we ended up being the only people in the place the entire time we were there. The brunch was very good and filling, but as-is, for us, it is not worth returning. If you only love exactly what they provide, this is the place for you… But we like options, and frankly, we were also disappointed with the bloody. A place like this prides itself on its craft cocktails, so we were really hoping the Bloody Mary would be something special. Jimmy Luv’s and modest fixin’s left us wanting more. You get a ton of food (we had to take half ours home) for a great price, but I would have paid more for a great Bloody Mary. They should think about creating a house mix and infusing their own vodka, or at the very least adding so flair in the fixin’s. We want so badly to like this place and to see businesses succeed in this community, but our first two trips have left something to be desired. We will give it one more shot on a weeknight happy hour-perhaps that’s when they’ll shine. 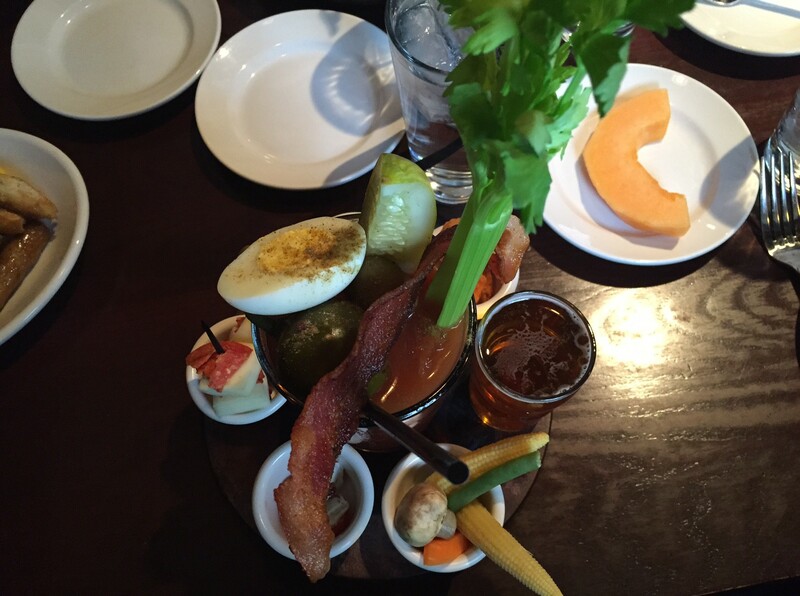 In the meantime, if you’re looking for a brunch option, you certainly can’t go wrong with this one. Our waitress also hinted that they might be expanding their menu as well, which would be very welcome. This morning, I had brunch with friends at Burke’s Lakeside in Oconomowoc. For just $12.95, you can access a full buffet with all kinds of breakfast and lunch foods, including made-to-order omelets and pasta. Mix: They use Zing Zang. Burke’s is a pilgrimage every bloody mary fan needs to make at least once. 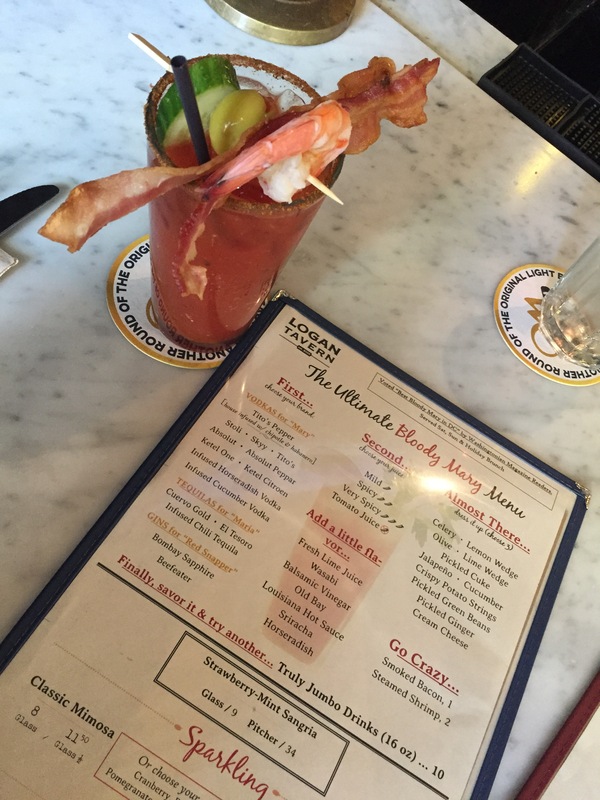 The Wisconsin Supper Club Bloody Mary is only served on Sundays, so you’ll want to make the most of your trip and plan on staying for brunch. Cheers! 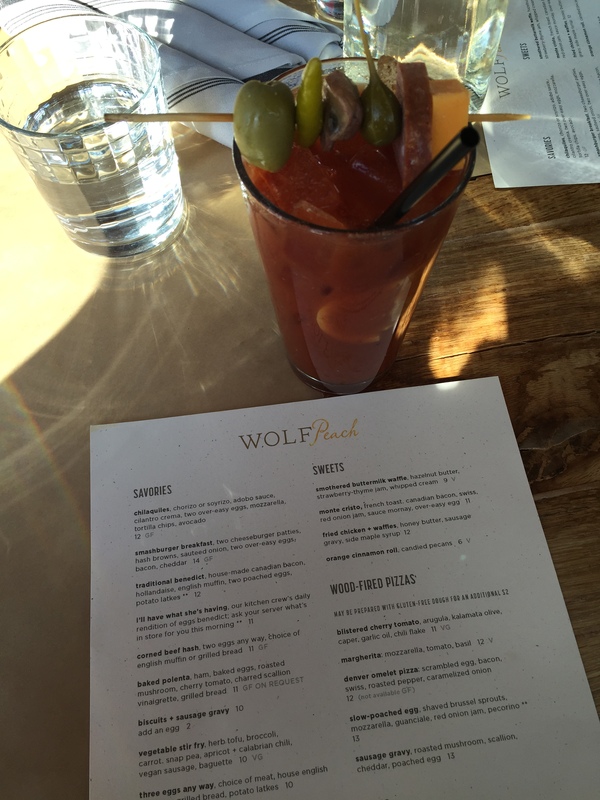 This morning, I had brunch with two friends at Wolf Peach in Milwaukee. I had previously reviewed their Bloody Mary in the fall of 2013, but I felt this merited a new review since the drink seems to have changed. Spice: I ordered it spicy and it arrived with just the right amount of spice. 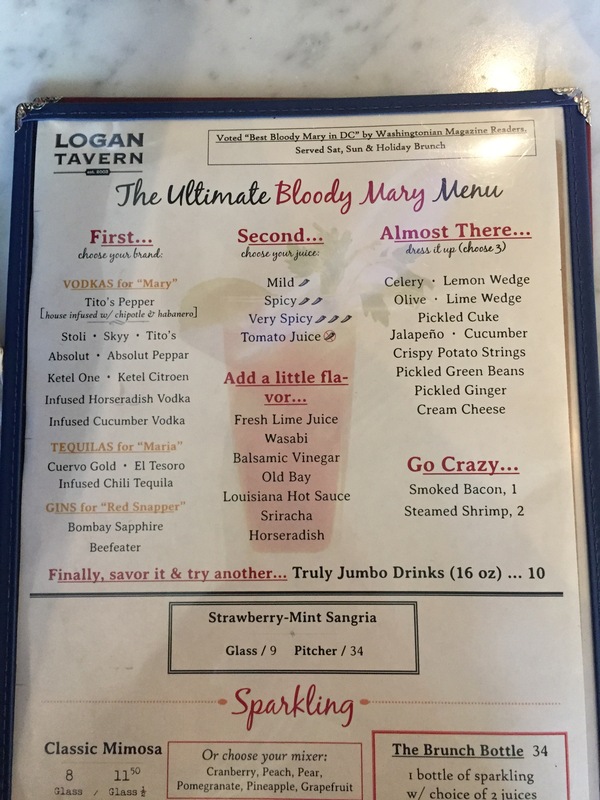 I had enjoyed their Bloody Mary previously and this one, although they added fixin’s and the chaser option, was just not the same as I remember. It was still good, don’t get me wrong, but I think I liked that first Bloody better. The food, however, was delicious! As you can see from the menu, their brunch selection is very rich. I ended up ordering the smashburger breakfast and couldn’t finish the enormous portion. I recommend checking out this spot for dinner or brunch–in addition to the delectable delights, the space is cool and the view of the city is amazing. Our final Bloody Mary in Florida was my favorite, but I have to say it is because I had a little more say in the matter. Mix: Unsure… it was sweet and tasted “vegetable-y” to my companion. I think it was Campbell’s if I had to take a guess. Fixin’s: One lime and two olives, originally, but we took care of that. We were here for a brunch buffet ($25/person), so I picked up some Bloody Mary essentials at the buffet and used them to spruce up the drink. Crab, shrimp, asparagus, cheese, meat…. ah, I almost felt like I was back home for a minute there. I really wish restaurants outside of the Midwest would catch on to this trend. Especially in places like Florida, where they have a heavy population of defectors from the cold weather states! Aside from having to doctor up my own drink, the brunch here was quite good and filling. We also enjoyed seeing the indoor aquarium, where people also have the chance to swim with the fishes!